Despite ongoing U.S. strikes, extremist backers of the Islamic State (IS) could still launch attacks on U.S. citizens and personnel with "little to no warning," according to a senior Department of Homeland Security official, who warned on Tuesday that DHS is "increasingly concerned" about IS backers who "may choose to carry out attacks in the homeland rather than attempt to travel overseas." 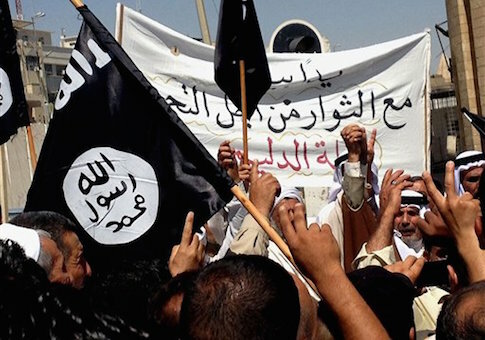 Tom Warrick, deputy assistant secretary for counterterrorism policy at DHS, told House lawmakers Tuesday morning that agency has become "increasingly concerned" about the threat posed by extremists inspired by IS (also known as ISIL or ISIS). With "little-to-no warning" IS supporters could carry out a domestic attack on U.S. soil, rather than travel abroad overseas to fight alongside IS fighters in Syria and Iraq, Warrick said. While DHS still "is unaware of any specific, credible threat to the U.S. homeland from ISIL," agency officials are aware that "terrorist groups based in Syria have demonstrated the intent and capability to target American citizens overseas," Warrick told the House Foreign Affairs Subcommittee on Terrorism, Non-Proliferation, and Trade. "ISIL constitutes an active and serious threat within the region and could attempt attacks on U.S. targets overseas with little-to-no warning," Warrick said. Attacks by IS sympathizers on the United States also pose a threat since they could be carried out by the militant group’s "supporters acting without specific direction from ISIL leadership with little-to-no warning," Warrick said. "Even before the events of August and September in Syria ISIL’s leader publicly threatened ‘direct confrontation’ with the United States in January 2014," Warrick said. "DHS is increasingly concerned that ISIL-inspired individuals may choose to carry out attacks in the homeland rather than attempt to travel overseas." IS continues to gain strength and "has capabilities most terrorist groups do not possess," he explained. However, IS is not the only threat. Al Qaeda, despite the deaths of its senior leadership, remains "a major concern for DHS." "These groups maintain the intent and, in some cases, the capability to conduct attacks against U.S. citizens and our facilities," Warrick said. Al Qaeda in the Arabian Peninsula (AQAP) "and other terrorist groups have shown they can adjust their tactics, techniques, and procedures to target the West in a number of ways." DHS also is aware "of a number of U.S. persons" who have attempted to travel to Syria this year in order to "engage in fighting there," according to Warrick. "More than 100 U.S. persons and over 2,700 Westerners have traveled or attempted travel to Syria to participate in the conflict," according to figures provided by Warrick. Those who travel to Syria, become further radicalized, then travel back to their Western homeland also are a point of concern for DHS. "We are concerned about the threat of foreign fighters from the United States or elsewhere who might go to Syria, become even more radicalized, and then return to their home countries, including the United States, where they might try to conduct attacks either on their own or in concert with others," Warrick said. Those with Western passports "may become further radicalized to violence while receiving additional training and experience, and pose a potential threat upon their return to their home countries or other countries to which they may travel," he said. Aviation continues to appeal to terrorist entities, according to Warrick. "Terrorist groups have shown a continued interest in developing ways to defeat aviation security, and in carrying out, or attempting to carry out, attacks on U.S.-bound civil aviation aircraft," he said. Technology is another fascination of these terrorist groups, which aspire to turn everyday items in improvised explosive devices. "Terrorists in the past three years have expressed interest in concealing IEDs in modified commercial electronics including laptops, cell phones, printers, and cameras," according to Warrick. "Terrorists have also expressed interest in concealing IEDs in physical areas of the body they perceive as not thoroughly searched, or areas we cannot search, such as in the body," he said. Rep. Ileana Ros-Lehtinen (R., Fla.) expressed concern over IS's growing strength. "The reach of this terrorist organization has extended beyond our initial assessment as we saw the tragic killing of four people at the Jewish Museum of Belgium in Brussels," Ros-Lehtinen said. "The possibility of homegrown or lone-wolf attacks like these, inspired by ISIL, should be of grave concern to law enforcement officials everywhere." "The sheer number of foreign fighters joining ISIL is cause for alarm and any attempt to downplay the threat is misguided and dangerous," she said. "We must look at all options available to us to prevent fighters traveling to Syria and Iraq, from returning to the United States, and their recruitment in the first place." This entry was posted in National Security and tagged Al Qaeda, Islamic State, Terrorism. Bookmark the permalink.